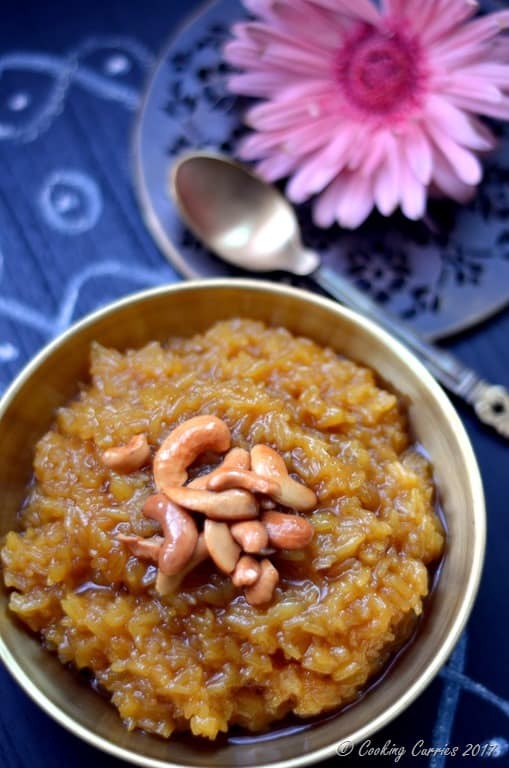 Sakkarai Pongal or Sarkkarai Pongal or Chakkara Pongal is the sweet version of Pongal with rice sweetened with jaggery and scented with cardamom. 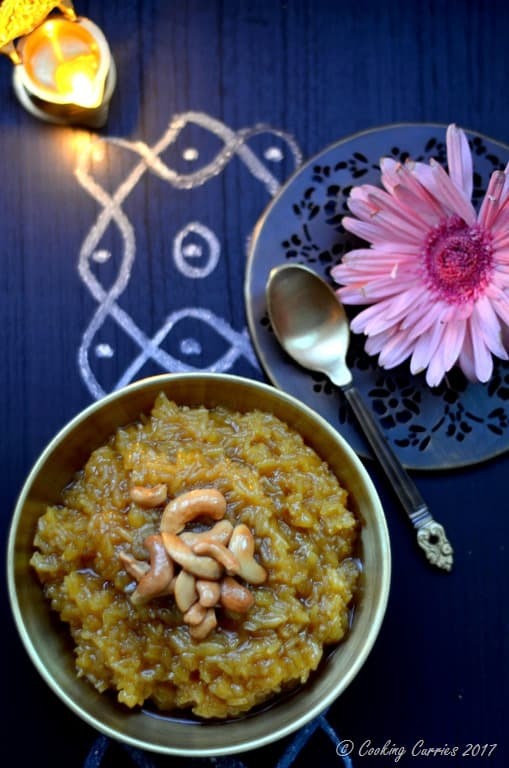 This Sakkarai Pongal recipe is a little different from what you may see out there. The unique combination of Tamil and Kerala cultures is so melded in the roots of my family to the point where we are sometimes confused, where a word or phrase that we say or a kind of food we cook, comes from. And I believe that over time my great grand mom and her mom have created their own versions of popular recipes based on what the ancestry dictated and where they lived and the kind of produce and grains that was available to them. This Sakkarai Pongal is such a classic example of that. This is a recipe of Tamilnadu origin and if you look around most recipes have some form of dal in it – green mung or the yellow moong dal. And most recipes also don’t have any coconut in it. The rice and dal is also cooked together to be an almost mushy mix. In my family, it was my paatti (grand mom)’s rule that the rice should be only about 90% cooked and should not be mushy at all. Also no dal is added and there is always lots of grated coconut in our sakkarai pongal. And she always went for jaggery that was real dark in color because for her it had to look nice and dark and rich and not have a watered down look with the pale colored jaggery. I always thought that is how Chakkara pongal was made and wondered why everyone else made their chakkara pongal the way they made it. 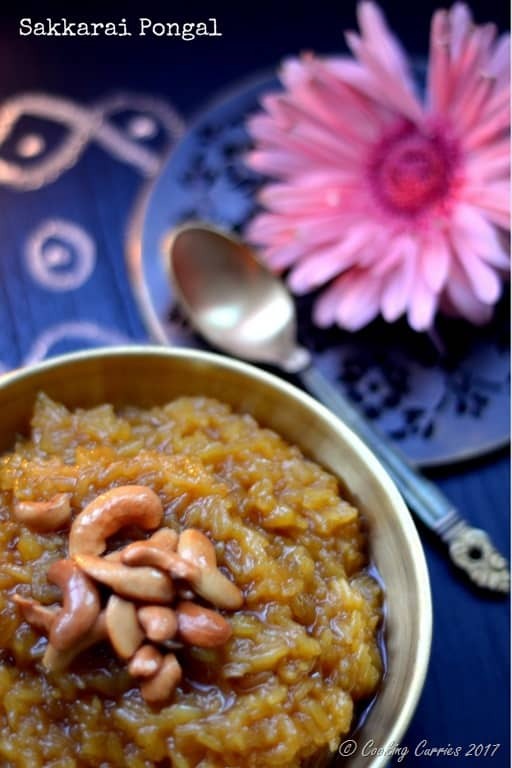 With not much color in it, milk or dal added to it which brought down the heavy sweetness of the jaggery. Little did I know that, that is how chakkara pongal is really made in most places and the one made in our house was an exception. And later I learnt it is because of the Kerala influence that the coconut came in and the final product almost resembled a similar payasam made in Kerala – Aravana . Well, this is still a version of Sakkarai Pongal and I never make it any other way. It is so rich and the flavors develop so well that every whiff, every bite full of it is a gastronomic pleasure in itself. Try it once and I am sure you will never go back to making it any different ever again! Wash the rice well and cook with the 2 cups of water till all the water evaporates and close and keep. Melt the 2 cups of jaggery with about 1/4 cup water over medium heat. Strain the jaggery, if needed. 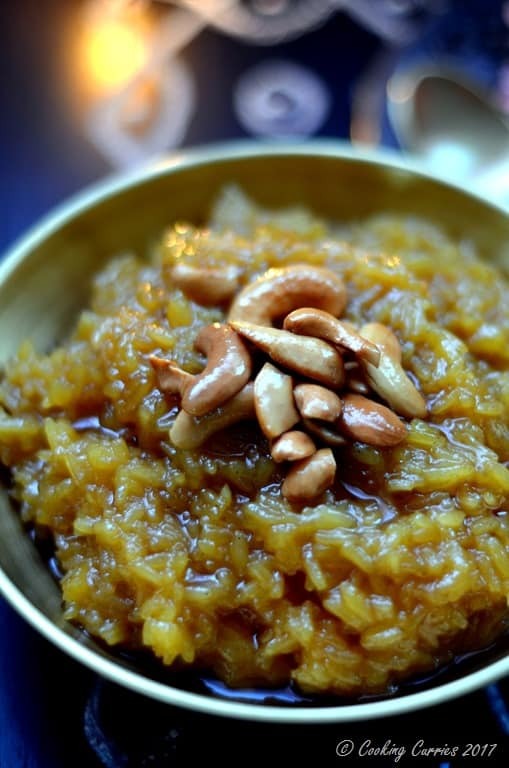 Bring the jaggery mix back to boiling over the stove top and add the cooked rice to it. Mix well and let it simmer for a few minutes. Add the crushed cardamom, the grated coconut and the 1/2 cup ghee and mix it all in well. Meanwhile, heat the 2 tbsp ghee in a small pan and fry the cashews in it till golden. Mix this into the rice mixture and serve hot.